We have single, double and executive, all equipped with Internet access, telephone, electronic locks, 21 "TV with cable. We offer you the Restaurant El Algarrobo, Bar La Hacienda Coffee Bar, Conference Rooms, Executive Rooms, Casino, souvenir shop. With your card you can earn AAdvantage miles American and Gold Crown Club card you can get great discounts and accumulate points. 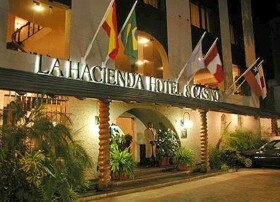 La Hacienda Best Western Hotel & Casino is strategically located in the district of Miraflores, near the beaches of the Costa Verde, 25 minutes from Jorge Chavez International Airport and 15 minutes from downtown of the city of Lima. Miraflores is Lima's most touristic area, with easy and quick access to shopping, financial, cultural, tourist and entertainment attractions. 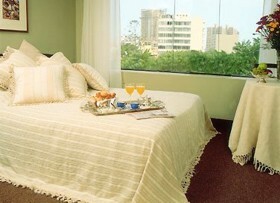 ¡The ideal place to stay while in Lima! 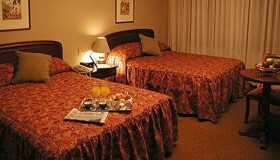 We have single, double and executive suites. 21 "color TV with cable system. Current Electricity 110 - 220 V.. 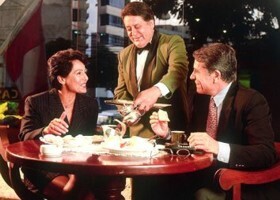 Restaurant "El Algarrobo", open 24 hours. Bar "La Hacienda Coffee Bar". Conference room with air conditioning and audio and video. Fully equipped Business Center. Executive Room with access to Internet, fax modem, computer, photocopier.Souvenir shop. With American AAdvantage card can earn miles for free travel to any destination of American Airlines. With its Gold Crown Club International card designed for frequent travelers can get big discounts on all Best Western and earn points that can be redeemed for prizes that include restaurants, shopping certificates, hotel accommodations Best Western, etc..